At Italyabroad.com we only work with small and passionate wine makers and artisans, we only sell the wine and food we love We don’t tell fairy tales to justify huge discounts and ridiculous prices, the only stories we tell are the ones of our producers and ours and why we love them. 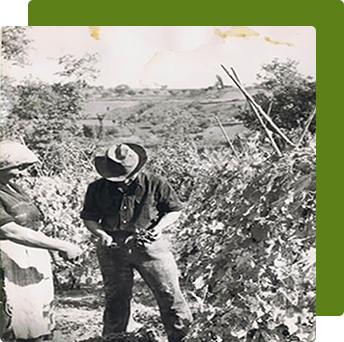 Our story begins a long time ago (long before I was born), in a small Italian village in Abruzzo, where my grandparents, Ida and Ettore (seen in these two photographs), and their parents before them, were tending vines and making their wine on hillsides overlooking the medieval town of Gissi. In post war Italy, cars were for rich people, and Ida and Ettore were not; they would get up at 3:00 am in the morning, and would set off with a donkey carrying all the necessary equipment. 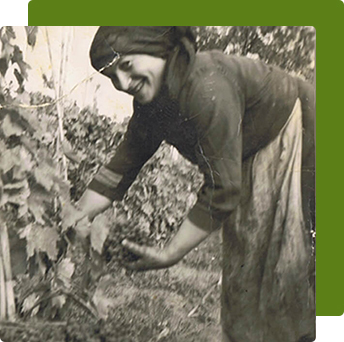 My grandparents would walk some 10km and work until 12:00pm, and then return home, weary from the days physical excursions, almost every day of the year, come rain or shine, just to make their own wine. Then I came along, and along came the tractors; the donkey was retired; but still, almost every morning for a few more years, my grandparents continued their work on the vineyards with the same commitment and the same pride that went into making their own wine and freely sharing their enthusiasm and knowledge of wine making with their grandsons. In our family food and wine were not considered commodities, for us, they are one of life’s real pleasures to be savoured and remembered. We have the same passion and commitment at Italyabroad.com, everything we import is made with love, care and with passion, from real people, with faces and with stories to tell, just like my grandparents. and believe that drinking and eating is a joy and eating well brings happiness. We only work with small and passionate Italian wine makers and artisans, people like us, that love what they do, you can learn about them in our community page. All our winemakers and artisans produce some of the best Italian wine and food, in the most natural way, respecting the environment. All our wines are made with handpicked grapes and our food is made with only the best natural ingredients, no long list of preservatives and don’t contain Palm oil. Our products are not mass produced but artisanally made. When is the last time you got excited when tasting something Italian? We are all about quality Italian wine and food from small producers, this is what we have always been, since we started in 2003. If you like what you read, you can start browsing with confidence and we guarantee that you and your taste buds will feel excited again and all without having to wait until your next trip to Italy. “It's unwise to pay too much, but it's worse to pay too little. When you pay too much, you lose a little money that's all. When you pay too little, you sometimes lose everything, because the thing you bought was incapable of doing the thing it was bought to do. The common law of business balance prohibits paying a little and getting a lot - it can't be done." “We saw a lot of new submitters at this year’s Sommelier Wine Awards, so competition for this award was intense. In the end, it went to Italyabroad.com – a Leeds-based company that was new to all of our judges. Key to its success was not just its ability to deliver four impressive Golds from a relatively small overall entry, but to deliver genuinely interesting wines at excellent prices"
If you dont like the wine or you think is faulty, or are not satisfied with any the food purchased, we will replace or refund it, no questions asked.